Wedding photography has long been established as a popular way to make money from your photography, but it can also be stressful, time-consuming and expensive to get started. Because of that, it’s a good idea to start off slowly, perhaps shooting weddings for family members or friends, before deciding if it’s really for you. Along with the necessary photographic talent – because the photos you take will be a couple’s greatest reminder of their day – you will need to be authoritative and take charge of proceedings when it’s time to get your images, but also be friendly, approachable and great with people. You will also need to be as good at promoting your business and yourself: it’s a competitive market out there, and business skills are almost as important as taking great images. No-one is going to hire you without any experience, so it’s worth shooting as many weddings as possible before you take the leap into the world of professional wedding photography. You can start by shooting candids and other less formal images as a guest for friends and family. When you do this, it’s important that you shouldn’t try to ‘compete’ with the main photographer, so don’t try to take over the posed or formal shots – but pay close attention to how they work and how you might approach similar shots. Another way to hone your skills before you go all-out as a wedding photographer is to get some training. There are many specialist wedding photography workshops and courses. They will give you an insight into how to shoot important occasions without the pressure of the real event. Once you have shot some weddings for friends and family, you could also try assisting a wedding photographer to get experience of professional wedding photography. To begin with, it's a good idea to contact some local photographers to see if they need an assistant. Wedding photographers tend to be extremely busy during the spring and summer, though, so it’s better to approach them during the quieter months of late autumn or spring. Don’t expect to get rich from this – it’s rare for an assistant to get paid any more than basic expenses for the day – but it’s a great way to get some experience of the business. If you already have some experience shooting weddings but don’t have the confidence to start out on your own, you could also try contacting local wedding photographers and offer to work as a second shooter. This involves working alongside the main photographer, capturing images that complement their shots. Even though you won’t be the main photographer, you still need to be able to prove that you are able to take good images before any photographer will employ you, as your shots will be part of the package supplied to the couple. This type of opportunity doesn’t come along very often, so along with contacting them, it’s also worth following plenty of local wedding photographers on social media to keep an eye out for any opportunities. At this stage, it’s tempting to shoot weddings as the main photographer for free, but this isn’t the best approach if you are serious about making money from your wedding photography, as it’s often hard to make the transition to charging a market rate for your photography after shooting for free. It’s better to get as much experience as possible by shooting as a second shooter or guest, then take the leap to charging for your time and work when you are ready to take on full responsibility for the job. Once you’re sure that wedding photography really is the career for you, it’s worth joining a professional body such as the Society of Wedding and Portrait Photographers . SWPP can help you with many aspects of starting out, from recommending courses and tuition, to enabling you to build contacts and even get suitable insurance. Don’t overlook that last point: when you are shooting weddings, you will need camera insurance cover for both your gear and public liability. Normal household insurance won’t offer public liability or professional indemnity if the worst happens. This type of cover costs around £200 per year in the UK, although the amount will vary according to the value of your kit, the amount of liability/indemnity cover you want, and where you are working. Even working as a second shooter or assistant, shooting a couple’s big day can be stressful enough without having to find your way around a new camera or flash, so make sure that you are completely familiar with how all your gear works, and be very wary of using a new piece of kit for the first time on a shoot. This is another area where shooting some weddings without the pressure of getting paid can help, as it will give you time to experiment with different settings and gear. While you need to know your equipment inside-out, buying everything before you start can be expensive, so it’s worth considering hiring some items for individual weddings, such as a 70-200mm f/2.8, or an 85mm f/1.4 lens to shoot portraits in low light. When hiring kit, make sure you give yourself time to familiarize yourself with how it works, so try to have it delivered a few days before the wedding. Whether you’re just a friend who’s been asked to be the ‘unofficial’ wedding photographer, or an aspiring pro who’s been asked to shoot the whole wedding, it’s vital to spend some time with the bride and groom well before the big day. This is important because it enables you to get an idea of what they expect, and – critically – to manage those expectations. if you prefer to shoot reportage-style images and they want you to plough through a long list of formal group shots, this is the time to address it. An experienced photographer can do both, of course, but even established pros have their own style, and it’s important to give the bride and groom an idea of what your style is at the outset – even if it’s just to clarify if they want you to shoot in colour or black and white, or both. If it helps, ask them to draw up a shot-list, or suggest one to them. 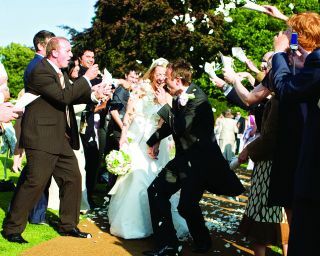 Meeting up with the bride and groom also gives you a chance to put them at their ease, and for them to get to know you. on the day, they’ll have more important things to worry about, so by meeting you beforehand, they can just leave you to it on the day. it’s fine to be nervous, especially if it’s your first wedding, but try not to show it! no matter how unsure you feel, you’ll almost certainly know more about photography than anyone else there. Arguably just as important as meeting the bride and groom is visiting their chosen venue or venues, preferably at the same time of day as the wedding is due to take place. This will give you a chance to experiment with different settings and to check what will work and what won’t. Will the bride be in direct sunlight when she arrives? Will there be enough light in the church to shoot handheld? is there a good shaded spot for shots of the newlyweds? Making these sorts of decisions beforehand will mean you don’t have to worry about them on the big day. The key to any wedding shoot is planning: planning the shots you’re going to shoot, the gear you’re going to need, and the settings you’re going to use. What many first-timers don’t realise is just how many images you need to shoot to come away with a strong set of images. To give you an idea of how freely you need to be shooting, you should count on taking at least 1,000 shots, and then editing these down to perhaps 300-400. The bride and groom can then preview these to decide on the 50-100 they want. If it’s an option, shoot in raw and jpeg; the latter will be quicker to preview and to process, but having a raw file will give you the confidence to know that if you’ve under- or over-exposed a key shot, you can always rescue it later. If you do shoot in raw you’re going to need plenty of spare memory (take double what you think you’ll need, just in case a memory card dies on you), and at least two fully charged batteries. Ideally, you should also take, or arrange to borrow, a spare body and kit lens for the day – again, just in case yours packs up just when the groom is reaching for the ring. A tripod is also useful for wide shots from, say, the back of the church, and a small step or stepladder is great for getting up high and providing a slightly different perspective. Break it down in terms of settings, try to keep things as simple as possible: for each shot or sequence, try to work out what’s most important and set up your camera accordingly. Want shallow depth of field or shooting in low light? Use aperture priority and set your lens’s maximum aperture. Still too dark? increase the ISO. Subject too small in the frame? Zoom in or move closer. If you break everything down into a series of options it’s less daunting than trying to do it all at once, and it soon becomes second nature. No matter what the bride and groom’s expectations are, there are certain key moments throughout the day they’re sure to want images of. You can use the list below to start drawing up a shotlist, but if you’re still not sure, try browsing the websites of a few wedding pros beforehand for ideas. When you find a set of images you like, try to work out what it is about them that appeals, and print a contact sheet of thumbnails to give you inspiration on the day. No shoot is complete without some behind-the-scenes shots of the bride getting ready. The watchword here is discretion – ideally, the bride shouldn’t even notice you’re there. Look out for natural light, unusual angles and reflections in mirrors. Try not to spend too long with the bride while she’s getting ready – after all, it’s quite a private time. Once you’ve got the shots you need, head to the church and use the time to shoot a few incidental shots – things like flowers, orders of service, the ring and so on. This is another key moment, and one that is arguably the most challenging: you have no control over the lighting, there’s no time for posing, and the bride will be moving! Follow the step-by-step guide overleaf, and keep shooting right up to the church door. Shooting indoors is always a challenge, especially if flash is prohibited. Again, the key is to be discreet (turn off any autofocus beep, for instance), and don’t be afraid to bump the ISO right up if you need to; better a grainy shot that an indistinct blur. Ask the best man to take charge of organizing the various groups that need to be photographed. Shoot in burst mode to maximize your chances of getting a shot without anyone blinking, and work quickly – nobody likes standing around waiting. With the bride and groom, you have more time to be creative. Try to find somewhere shaded and quiet, away from the other guests, where they can stroll, pose and gaze at each other. This can bring on a fit of giggles, which makes for a natural-looking shot. Your work as a wedding photographer isn’t finished at the end of the wedding day. When you start shooting professionally, you’ll also need to set aside plenty of time to go through your images, process the best ones and then present them to the couple. Even if you have only shot a wedding as a guest, try to approach processing your images as though you had shot the wedding for the couple. This means that you will have to sort through your images to pick out the best ones, and then process them. Even at this stage of your wedding photography it’s worth trying to find a processing style that suits your images, as it will give them a more consistent appearance and also allow you to batch-process many images, making only minor adjustments to individual shots afterwards. It doesn’t matter how good your photography is if no-one knows about you, so you’ll need to get to grips with marketing and selling your photography services before you even think about making any money. You can start by spreading the word among family and friends, and by setting up a website and getting active on social media. All of these need to be backed up with examples of your work. Also, getting some recommendations and testimonials from previous clients will help give potential customers more confidence in your services. When you are thinking about setting up a wedding photography business, you should look at the type of images that you shoot and try to find a cohesive ‘look’. Deciding on your style, and promoting your work in that style, will help to sell your services, as potential clients will have a good idea of the type of images that you will produce. A clear style will also make your business stand out from the many other wedding photographers in your area. This style will be a combination of how you shoot your wedding images and a consistent type of image processing. In addition to possessing solid photographic skills, in order to make your wedding photography business a success, you’ll need to be able to deal successfully with all sorts of people. First you’ll need to sell your photographic services successfully, so you may need to brush up on your sales and marketing skills. Then you’ll need to deal with the demands of clients, both before and after the wedding. This is often simply a case of making sure that you communicate clearly what they should expect of you as their photographer, and when to expect the final images or prints to be supplied. Finally, you will often have to take control of the wedding when it’s time to get your photos. This last skill can take some time to master, as it involves being able to corral the guests when you need them for group shots, but also knowing when to take a back seat, as you don’t want to take over the day. While an experienced wedding photographer may be able to get the most from a location on the day, it’s worth considering going along to the wedding venue before the event to give yourself some ideas of where you might be able to shoot the more formal groups and posed shots of the couple. It’s a good idea to check the position that the sun will be in on the day, and to prepare a back-up plan for places that might offer some covered shooting opportunities if the weather closes in. Even experienced wedding photographers often find it useful to have a shot list with them on the day. This will help to ensure that you have captured all of the most important events and images on the day, along with any specific shots that the clients have asked you to capture. Try to keep the list short and concise by only including the most important images that you need to shoot. Then on the day you should only need to refer to it occasionally: it won’t inspire confidence in your abilities if you spend more time checking the shot list than capturing the couple’s magical moments. On top of the time spent marketing and getting clients, then actually shooting the wedding and liaising with them, you’ll need to spend plenty of time processing your images and then arranging for them to be printed or made into a wedding album. This part of the process can take longer than the actual shoot, so remember to factor this in when you decide on pricing. With a little effort you could have your website, business cards and some initial marketing sorted out in a couple of weeks. But it will take a lot more time to start getting regular bookings and gain the experience you’ll need to make your business a success. You should look at around six months or so as a realistic period to get the basics of your wedding photography business set up, and it can take around a year to get a real sense of whether you can make a go of it. Remember that even though people get married throughout the year, it’s still quite seasonal. Most weddings take place in the spring and summer, and they are often planned well in advance. Because of that, don’t expect to get a huge number of bookings in your first year of business, particularly if you start in the spring or summer. You will find that even if you do take bookings, they will often be for weddings six to 12 months away. When it comes to pricing your wedding photography, there are many factors to take into account. As a new wedding photographer you’ll need to investigate both the market in your local area and the types of clients that you are aiming for. You need to match the prices that you charge to the level that clients are willing to pay for the experience and type of photography that you are able to offer. An experienced and well-established wedding photographer will charge around £1,000 to £1,500 for their basic photography package. As a new business it will be difficult for you to charge the top rates, but don’t price your services too low, as you’ll need to make a profit to make it worthwhile, and it can also be difficult to raise your prices significantly once you become known for shooting at a particularly low cost.